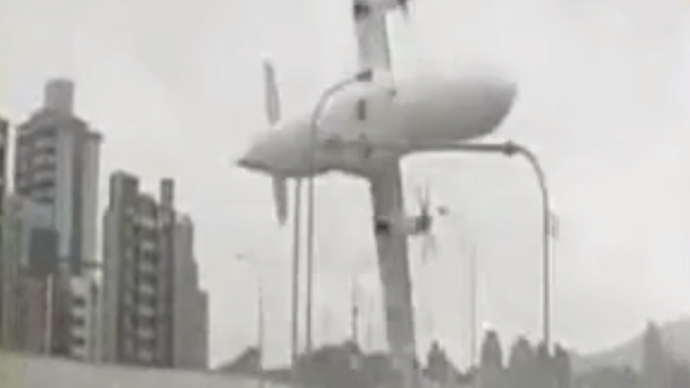 The moment when a regional TransAsia passenger flight crash-landed into a river was caught on dash-camera. One of plane's wings cut through a highway railing mere meters from the filming vehicle. The ATR 72-600 was carrying 58 passengers and crew on board. It plunged into the river right after take-off. At least 23 have been reported killed, with about a dozen others still unaccounted for. The last communication from the plane before the crash reported an “engine flameout,” a technical problem with either fuel supply or combustion that leads to engine failure. The plane missing the highway and crashing into the river probably allowed some of those on board survive the impact.